There was a nice surprise on my last shopping trip my local Loblaws. Unfortunately this wasn’t a slippery floor that I could have sued them for but there was a new addition to the snack aisle. President’s Choice has recently introduced a new line of flavoured ridged potato chips which included “Spicy Piri Piri”, “Blue Cheese and Buffalo Wing” and “General Tao’s Chicken” which all tasted like All Dressed. 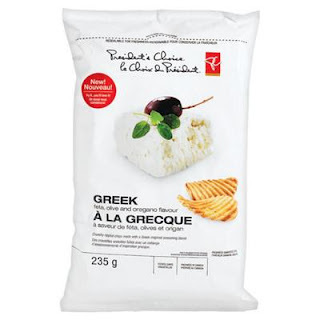 The surprise was the new PC Greek Potato Chips. As a Greek and a lover of carbs I was eager to try this new flavour which promised “Feta, Olive and Oregano” flavour. Could this PC chip deliver the taste of a Greek Salad on a potato chip? In Greece, both Lay’s and local brand Tsakiris produce Mediterranean flavoured chips. The best selling chip in Greece is the Oregano flavour, but they also produce flavours like “Lemon and Sea Salt”, “Tzatziki”, “Paprika” and “Feta”. The tzatziki flavour is horrible and the Paprika tastes like Bar –B-Q but oregano is a wonder plant…..or is it an herb? Could it be a flower? Whatever it is, it’s fantastic. It is used to flavour pizza, in Greek Salad, as a seasoning and to cure sore throats. In a pinch you can also fool pot smokers into believing it is weed. Was Canada finally lucky enough to have this wonder food? There was immediate disappointment upon opening the bag as it smelled like the rest of the All Dressed flavours PC offers. The food chemical factories of New Jersey got the smell all wrong but different results came from the taste. The first crunch delivered some tanginess that resembles feta and a spice that was either oregano or pepper and nothing resembling an olive. There was a slight garlic taste which had co workers offering me gum. The chip has found a home in my secret snack drawer and will be a welcome addition to Greek baptisms and while watching Nia Vardalos movies. Unlike Old Dutch Chips I did not feel like throwing up an hour after eating them. Unfortunately it will not replace the rush I get from opening up a bag of Lay’s Oregano when upon arriving in Greece. The oregano flavour is a simple flavour which PC should consider unleashing on Canadians.